Groups lacking a chordal instrument sometimes face inherent challenges especially when playing tunes from the Great American Songbook. That said, Sonny Rollins and Albert Ayler managed to produce classic recordings with this configuration. Think of Way Out West or Spiritual Unity. 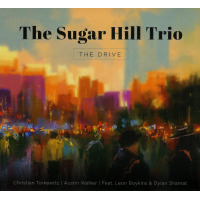 Whilst The Sugar Hill Trio isn't quite in that illustrious league, this unit gets pretty close and the resultant music is, in many ways, a synthesis of those famous exemplars. Eight of the eleven numbers on the album are standards with the remaining three composed by saxophonist Christian Torkewitz. Opening with Gigi Gryce's "Minority" is a good idea as it's a lively, memorable and well executed number. Torkewitz's "Open Circle" is a brisk paced composition also notable for Austin Walker's crisp drumming. A similarly fast pace is maintained on Coltrane's "Spiral" and here Leon Boykins on bass is particularly outstanding. Boykins plays bass on seven numbers whilst Dylan Shamat covers the other four. Torkewitz's second composition the ballad "Sunbeams," benefits from his fine flute work whilst "The Night Has A Thousand Eyes" is a breezy Rollins-esque workout and unsurprisingly, was recorded by the master on his 1962 album What's New?. Torkewitz returns to the flute on Oliver Nelson's "The Drive" and proves he can deploy the instrument to great effect, even at near-breakneck speed. Things slow down for Harry Warren's "You're My Everything" with Torkewitz evincing an elegant rendition of the melody. "Handles," the final number composed by the tenorist, begins with a confident head and includes an excellent pizzicato bass solo form Dylan Shamat. Thelonius Monk's "Ask Me Now" is a good example of how the trio's use of space is put to great effect with the soulful sax seductively teasing out the melody. The mood changes again with Jimmy Van Heusen's "Like Someone In Love" and offers Austin Walker a chance to solo with surgical precision. The set closes with "Theme For Basie" where the trio demonstrates that it can work as well in tight formation as it does freely. This trio has talent and ability and has produced an album remarkably rich in tonal and rhythmic variety. Track Listing: Minority; Open Circle; Spiral; Sunbeams; The Night Has A Thousand Eyes; The Drive; You're My Everything; Handles; Ask Me Now; Like Someone in Love; Theme for Basie. Personnel: Christian Torkewitz: tenor saxophone, flute; Austin Walker: drums; Leon Boykins: bass (tracks 1,2,3,4,5,6,11); Dylan Shamat: bass (tracks 7,8,9,10).